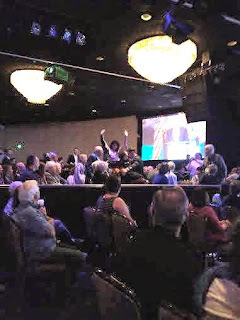 Far-left anti-Zionist troublemakers, Code Pink, accomplished nothing but self-aggrandizement by interrupting Israeli Foreign Minister Avigdor Lieberman at the Jewish National Fund Convention at the Beverly Hilton Hotel today, September 15, 2014. 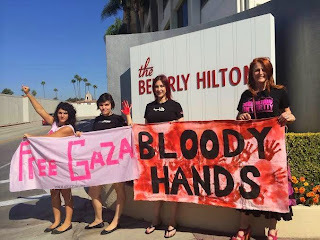 Far-left anti-Zionist troublemakers from CodePink-L.A. interrupted Israeli Foreign Minister Avigdor Lieberman to photograph and brag about. Jodie Evans and Kristin Delfs held up a banner and Sophia Armen held up fake-bloodied hands to commemorate what they termed "the latest Gaza slaughter that left thousands dead." The audence shouted them down as security escorted them from the premises. Foreign Minister Avigdor Lieberman addressed J.N.F. 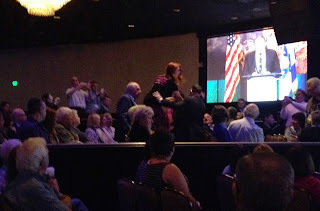 regarding the Jewish identity crisis created by unaffordable Jewish education costs in his full speech, provided by JooTube.TV. Would you help sustain JooTube's efforts enlightening the public with first-hand, original video? Click the Donate button in the right-hand column.